Italians are famous for a lot of stuff in the food business, but we are not famous for tea, which is a shame, because I hate that the Brits are better than us in something (to any Brits reading, love you guys). That is why we need more places like Fabrica all around the Boot to show them that we, too, have got some tea game. Here you will be able to choose between an incredible amount of different teas and infusions from all over the world, each one with a very distinct and peculiar taste. The staff is very passionate about what they serve and is always open to answer any of your questions in a competent manner. The only bad thing I can say about their tea is that they bring it in teapots made for right handed people and as a leftie this makes me mad all the time. If you are not into tea, do not worry, they also serve excellent cocktails, a few good Italian craft beers, great soft drinks and delicious hot chocolate. Top notch deserts are also available, with a special mention to their strudel which makes my taste buds cry of joy every time I have it. 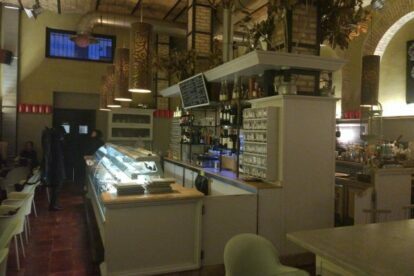 It must be said this is one of the most carefully designed places in Rome, as the location is wonderful and as soon as you enter you know you’re in an above average tea shop. If you want to impress a girl, this will do.